Commercial aviation as a means of public transportation and a business activity is exactly 100 years old on January 1, 2014. On January 1, 1914, four visionaries combined efforts to operate the first scheduled commercial flight. Percival Fansler organized the funding for the St. Petersburg-Tampa Airboat Line, which provided the first scheduled air service across Tampa Bay in Florida. Thomas Benoist’s airboat conducted the first flight, which was piloted by Tony Jannus. Abram Pheil, then mayor of St. Petersburg, paid $400 at auction for the 23-minute flight. The International Air Transport Association (IATA) is launching a year-long celebration of the 100th anniversary of commercial aviation and invites the public to take part in a conversation about what needs to happen to make the next 100 years of commercial aviation even more memorable. A website, www.flying100years.com, will be launched on January 1 to host the centennial celebration. Along with historical and economic reference materials, the website will also be an interactive information hub depicting the value that commercial aviation provides from personal, economic and other perspectives. Twitter conversations about aviation’s first century can be linked through #flying100. IATA is one of the sponsors of ‘Flight 2014’, which is planning to re-enact on January 1, 2014 the first commercial passenger flight 100 years previously. The flight will use a Hoffman X-4 “Mullet Skiff” amphibious flying boat, similar in many respects to the original Benoist airboat which performed the first flight. The Hoffman X-4 will take off from St Petersburg, Florida and fly across the bay to Tampa at 10:00 a.m. U.S. Eastern Standard Time, re-tracing the exact path taken by pilot Tony Jannus and passenger Abram Pheil 100 years ago. Information about the January 1, 1914 original flight and the 2014 recreation may be found at www.airlinecentennial.org. Commercial aviation began with only one passenger on one route on 1 January 1914. Now, on average, more than 8 million people fly every day . In 2013 total passenger numbers were 3.1 billion, surpassing the 3 billion mark for the first time ever. That number is expected to grow to 3.3 billion in 2014 (which is equivalent to 44 per cent of the world’s population). About 50 million tonnes of cargo is transported by air each year (about 140,000 tonnes daily). The annual value of these goods is some $6.4 trillion ‒ or 35 per cent of the value of goods traded internationally. Commercial aviation supports more than 57 million jobs and generates $2.2 trillion in economic activity. The industry’s direct economic contribution of around $540 billion would, if translated into the GDP ranking of countries, place the industry in 19th position globally. IATA expects global airline industry revenues to reach $743 billion in 2014, with an average industry net profit margin of 2.6 per cent. The website www.flying100years.com will be launched on January 1 to host the centennial celebration. Along with historical and economic reference materials, the website will also be an interactive information hub depicting the value that commercial aviation provides from personal, economic and other perspectives. 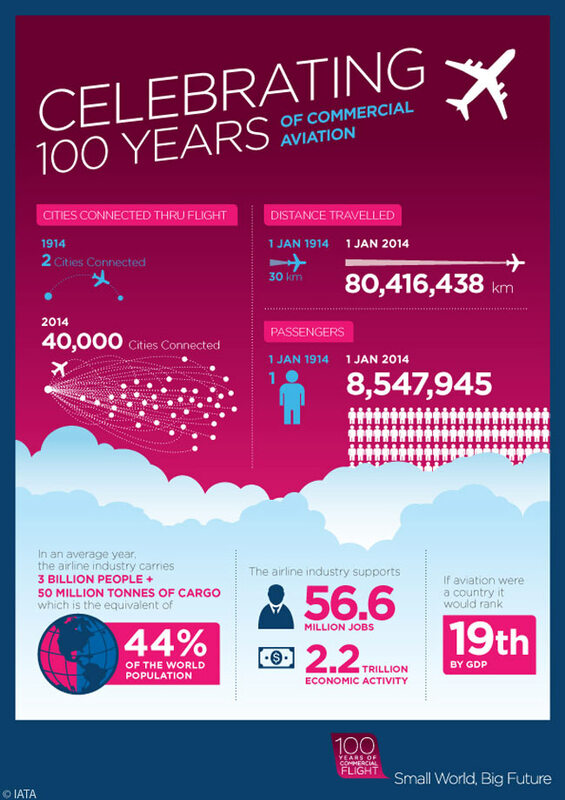 Twitter conversations about aviation’s first century can be linked through #flying100.